The Assembly elections in Mizoram are being held under the strict guidelines of the widely-influential Mizoram People’s Forum, an election watchdog controlled by the synod, the largest Church body in Mizoram. The forum has formulated 27 rules for the political parties and candidates. No candidate can organise political meetings without the forum’s permission. One of the rules advises political parties to compile an election manifesto, which can be implemented, instead of making empty promises. So strong is the all-pervasive control of the synod on the state, which will elect a 40-member Assembly on November 25, that even the Opposition parties, who feel that the forum is soft on the ruling Congress party, don’t have the confidence to file a complaint with the synod or the administrative authorities. 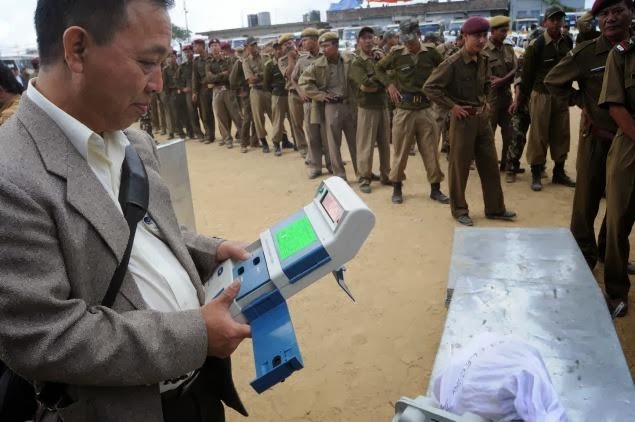 Security has been tightened along the unfenced 64-km-long border near the tri-junction of Mizoram-Tripura-Bangladesh in the state's Mamit district ahead of the November 25 Assembly polls, state Chief Electoral Officer (CEO) Ashwani Kumar today said. Kumar told PTI that patrolling by Central para-military force personnel has been intensified in the area as the Bangladesh and Tripura sides were frequently used by north east insurgents for crimes like abductions and extortion.